2012-10-08 Johannesburg – A new online resource to help civil society and patient groups challenge unwarranted pharmaceutical patents, called the ‘Patent Opposition Database’, was launched last week by Doctors Without Borders/Médecins Sans Frontières (MSF). However, this tool will remain largely unusable in South Africa unless the country changes its restrictive patent laws, which don’t allow patents to be examined, let alone challenged. Patents can often block the production of lower-cost generic versions. A “patent opposition”— a legal challenge to prevent or overturn the granting of an unnecessary patent — is allowed under international trade rules as a way to keep checks and balances on pharmaceutical patenting. 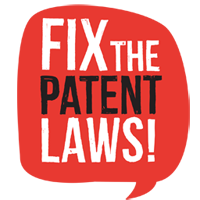 But South Africa’s intellectual property law does not allow for patent opposition, meaning civil society and generic drug companies can only fight against unjustified patents once they have already been granted and through lengthy and costly court battles. South Africa also lacks a formal examination system, and therefore grants patents very easily. In 2008 alone, 2,442 patents were awarded in South Africa, compared with Brazil, which only gave 273 patents over a five-year period (2003 to 2008). In addition, South Africa allows medicines whose patents have expired to be given new patents for small changes to an existing drug, which delays cheaper generic versions of medicines from coming to market. The Patent Opposition Database aims to guide civil society groups through the process of challenging an unjustified patent. It will allow organisations to build alliances and share vital specialist knowledge, as a patent application can often be challenged in different countries on the same basis. It contains a searchable listing of 45 patent oppositions, from Brazil, India, Thailand, Vietnam and Spain relating to key medicines, and over 200 other supporting documents that will aid in the building of future patent oppositions. The resource will grow as more data is added. “Patent oppositions are an important tool to bring checks and balances to the patent system and improve access to essential medicines. But the current South African law means we have our hands tied behind our backs.” said Mara Kardas-Nelson, Access & Innovation Officer with the MSF Access Campaign in South Africa. Successful patent oppositions by civil society in India, Thailand, and Brazil, among others, have been important for bringing affordable generic medicines to market. For example, Indian activists opposed a patent on lopinavir/ritonavir (used to treat HIV in patients who no longer respond to first-line treatment) claiming that it was not a new drug but rather a combination of two existing drugs. The patent opposition was successful, and today generic lopinavir/ritonavir is available in India at R2.18 per 200 mg/50 mg pill, or R3,139.20 per patient per year. However, as South Africa does not allow for patent opposition; does not examine its patents; and grants new patents on existing drugs, the lopinavir/ritonavir combination was given a patent in the country. Sold under the brand name Aluvia by the drug company Abbott Pharmaceuticals, South Africa procured the drug at R2.57 per tablet as part of the 2010 ARV tender – which amounts to R3,699.24 per patient per year. If South Africa were to use generic versions of the drug, the country could save R560.04 per patient per year. 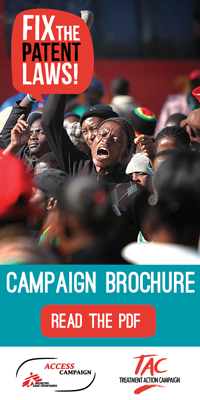 Giventhat South Africa has approximately 1.6 million HIV patients on treatment (with an expected 3 million on treatment by 2015) the savings would be significant. South Africa has a strong history of fighting unfair patents when the prices of medicines are set prohibitively high. In the 2000s, the Treatment Action Campaign (TAC) and the AIDS Law Project took the drug companies GlaxoSmithKline (GSK) and Boehringer Ingelheim, and MSD/Merck, to court over excessive pricing of key anti-retroviral medicines. As a result of the cases, these companies were forced to allow for generic manufacturers to make versions of these drugs, reducing the price dramatically. In the case of a 30-days supply of AZT/lamivudine 300mg/150mg, originally patented by GSK, generic competition caused the price to drop by over 70%. These historic cases relied on competition law rather than intellectual property law to fight patents which impede access to medicine. In contrast, because of flexibilities written into their intellectual property laws, civil society in other middle-income countries, such as Thailand, Brazil, and India, have used patent oppositions, which have successfully prevented undeserved patent monopolies from being granted. While the country’s use of robust competition law is vital for the protection of the public interest, South African intellectual property law should also incorporate the pro-active approach of a patent opposition.